Avengers: Endgame's Time Travel Explained By Captain Marvel's New Power? Does Captain Marvel's time-travel power explain how the Avengers will travel back in time in Avengers: Endgame? At the moment, the plot of Avengers: Endgame is a closely guarded secret. Indeed, there have been rumors that the film's marketing will only use footage from the first 15 or 20 minutes of the movie, which Marvel Studios president Kevin Feige has since confirmed that. One thing seems certain, though; somehow, Earth's surviving heroes will manage to thwart Thanos. Although Avengers: Infinity War ended with the Mad Titan succeeding in his insane goal of erasing half the life in the universe with a snap of his fingers, the Avengers will ultimately triumph. All those who died will return; that's pretty clear given Infinity War killed off characters known to be appearing in MCU sequels, such as Spider-Man, Doctor Strange, and Black Panther. The snap will be either averted or undone, and Thanos will be defeated. But just how will the Mad Titan be beaten, and what part Captain Marvel will play in Avengers: Endgame? In spite of Marvel's general secrecy, the plot of Avengers: Endgame is gradually becoming clear - and a surprising hint from Samuel L. Jackson may have explained Captain Marvel's role in it. The first trailer for Avengers: Endgame confirmed that the Avengers have a desperate, last-ditch plan to put matters right on a galactic scale. In one crucial scene, Steve Rogers and Black Widow talked about this mysterious plan; "This is going to work, Steve," Black Widow insisted. The deaths of Bucky and Falcon seem to have shaken Captain America to the core, and he's still grief-stricken. In an unusual twist, Black Widow appears to be the one offering strength and counsel. But, while the trailer did offer a glimmer of hope in this scene, it remained absolutely silent about just what idea the Avengers have come up with. In order to work that out, you have to refer to set photos. Set photos have made it clear that Avengers: Endgame will see the Avengers travel back in time. There have been many shots of the stars wearing classic costumes from 2012's The Avengers, Zoe Saldana has been glimpsed in her outfit from Guardians of the Galaxy, and there have been reports long-dead characters like Crossbones and the Ancient One will be returning. Crucially, one batch of set photos showed scenes clearly set during the Battle of New York, but with an unexpected addition - Paul Rudd was on set dressed up as Ant-Man. Given his character wouldn't be introduced into the MCU until three years after The Avengers, it seemed to be a strong indication there'd be time-travel. More set photos showed Robert Downey, Jr.'s Tony Stark wearing a S.H.I.E.L.D. uniform that's been seen before in the MCU - worn by the S.H.I.E.L.D. unit Nick Fury assigned to guard Loki in the Helicarrier. Interestingly, those uniforms typically incorporate a face-mask, meaning Stark would be able to conceal his face with ease. And Downey was spotted in the same building photos were snapped showing Chris Hemsworth in the 2012 Thor costume, and Loki in chains. It strongly implied that Stark was attempting to infiltrate S.H.I.E.L.D. back in 2012, perhaps to contact Loki for some reason; the fact he was using subterfuge was significant, as it suggested the Avengers were attempting to minimize the disruption they caused to history. 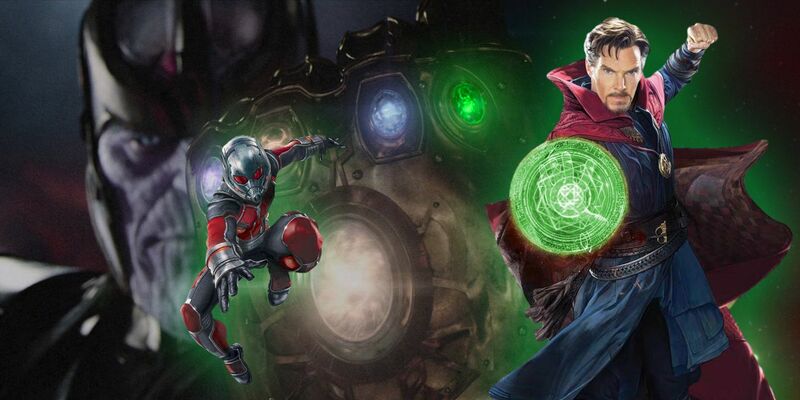 The Marvel Cinematic Universe has certainly been edging closer to the concept of time-travel, particularly with the introduction of the Quantum Realm. The Quantum Realm is a mysterious plane of existence that can primarily be reached by going subatomic in size; in accordance with certain (real-world) theories of quantum mechanics, it's a place where all the normal laws of space and time break down. In theory, by accessing the Quantum Realm it should be possible to alter the very rules of reality itself, or even to travel in time. This idea was strongly supported by the post-credits scene of Ant-Man & the Wasp, which saw Scott Lang stranded in the Quantum Realm in the aftermath of the snap. Before he entered the Quantum Realm, Janet Van Dyne warned him not to get trapped in any "time vortexes." The film's director, Peyton Reed, admitted that this could set up Avengers 4 time-travel. Concept art even showed that Marvel considered explicitly introducing the idea in the film, with the characters visiting a so-called "Nexus" of memories in which a person can rewrite history. The common theory is that Scott will get caught in a time vortex, and will emerge in a post-snap future. His unexpected return will clue the Avengers in on the fact that time-travel is possible, and they'll come up with their plan. This seems to be a reasonable theory, especially given the focus the first Avengers: Endgame trailer placed upon Scott's unexpected return. But it leaves so many questions unanswered, particularly about just how time-travel works in the MCU. Scott would presumably simply emerge wherever a time vortex spat him out, but in order to actually use the Quantum Realm the Avengers will need a way to control it. Meanwhile, just what model of time-travel is the MCU intending to embrace? Every science fiction and fantasy series has their own model of temporal mechanics, which governs such basic ideas as whether it's possible to change the past or not. Certainly Tony Stark's decision to infiltrate S.H.I.E.L.D. in disguise suggests the Avengers fear that history could be rewritten for the worst, and they're attempting to contain the changes they make. But, frankly, what's the point of such subterfuge? If they're attempting to undo or avert the snap, then sooner or later they'll have to make a pretty drastic change that will (hopefully) result in half the life in the universe not being killed. Why would the Avengers be worried about changing the events of the Battle of New York, when they're attempting to change history on a universal scale? So far, it's difficult to say - but Captain Marvel may offer a vital clue.